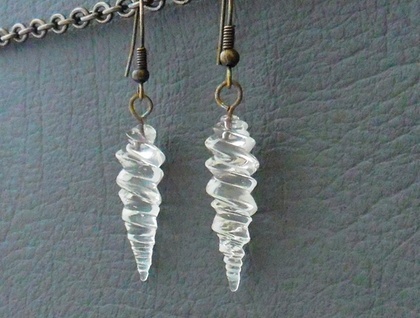 Handmade, clear glass unicorn horns hang from antiqued-brass coloured ear-hooks. These sweet alicorn charms are of uncertain age, but are possibly vintage (i.e. at least 30 years old), and the brass wire at their tops has aged and developed a nice patina. They are handmade, so all the horns are slightly different, measuring between 26mm and 30mm long (not including the wire loops at their tops), and between 7mm and 10mm wide at the widest part of the horn. They may appear white in the photographs, but they are clear glass, though some have a white streak twisting through them. 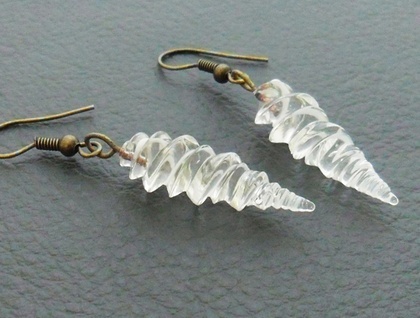 The brass wire loops at their tops also vary in length and show varying degrees of patina. 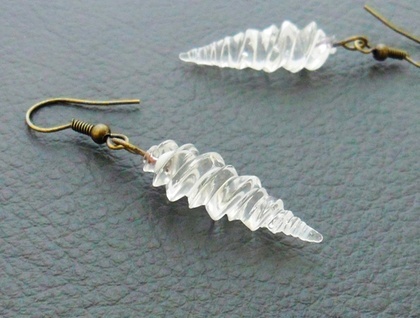 I find these variations quite charming, as they add to the organic, old-fashioned look of the earrings. 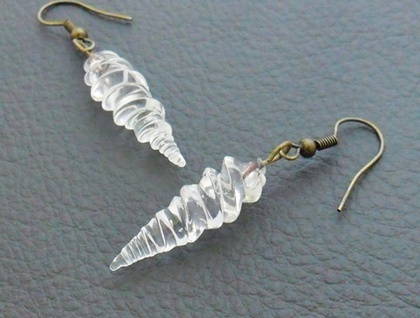 These size differences mean that each pair of 'Alicorn' earrings measures between 52mm and 59mm from top to bottom. Within each pair, I have matched the alicorns as closely as possible in size and shape. If you have a preference for a longer or shorter pair, let me know in the 'notes for silverlight' field that will appear when you check out of Felt, and I'll send you the longest or shortest pair that I have in stock. This is a limited edition Silverlight Jewellery design: once I run out of the lovely alicorn charms, this design will be discontinued. Other alicorn earrings are available here in my Felt shop.